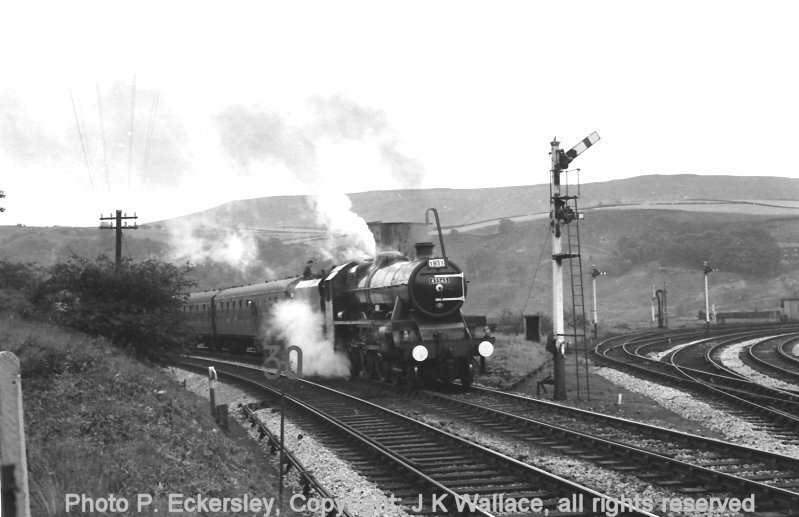 Eric F Bentley caught WD Austerity 2-8-0 90345 at Stansfield Hall (Todmorden) on a westbound mixed freight stopping passing the water tank, and about to cross the junction before picking-up a banking loco on Saturday 30 July 1966. WD Austerity 90217 stands by the water tank at Stansfield Hall Junction with a loaded mineral train, whilst a banker can be seen in the background. Photographer Eric Bentley, copyright JK Wallace. 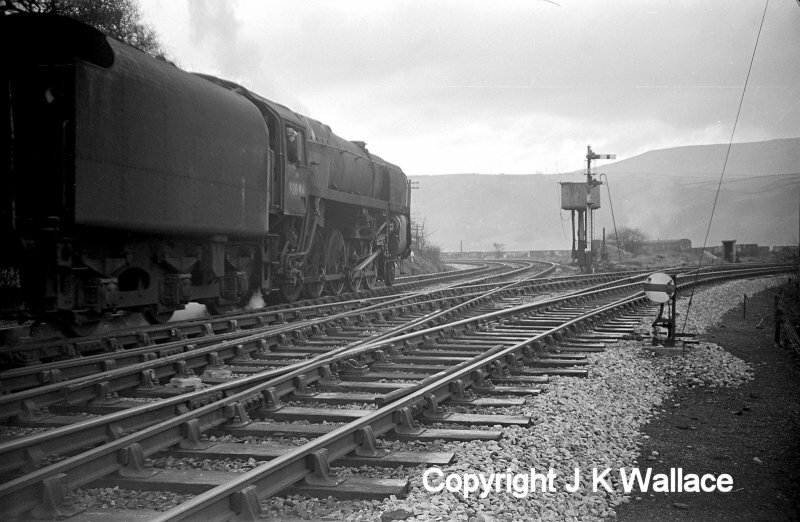 Stanier 8Fs 48218 & 48711 (Rose Grove) banking locos waiting at Stansfield hall Todmorden to work up to Copy Pit Summit 06.30 Saturday 10 June 1967. 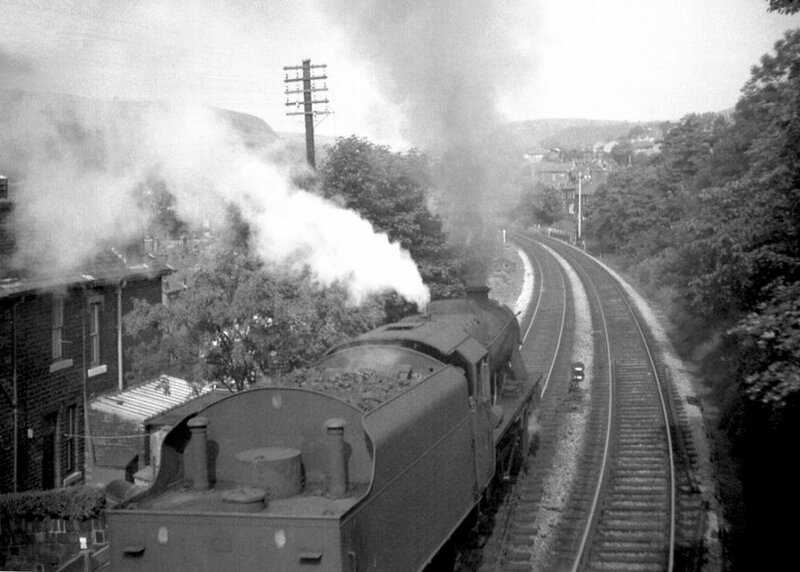 Jubilee 45565 'Victoria' stands at Stansfield Hall Junction taking water whilst heading a Leeds - Blackpool special 1M91 on 23 July 1966, having originated from Leeds. 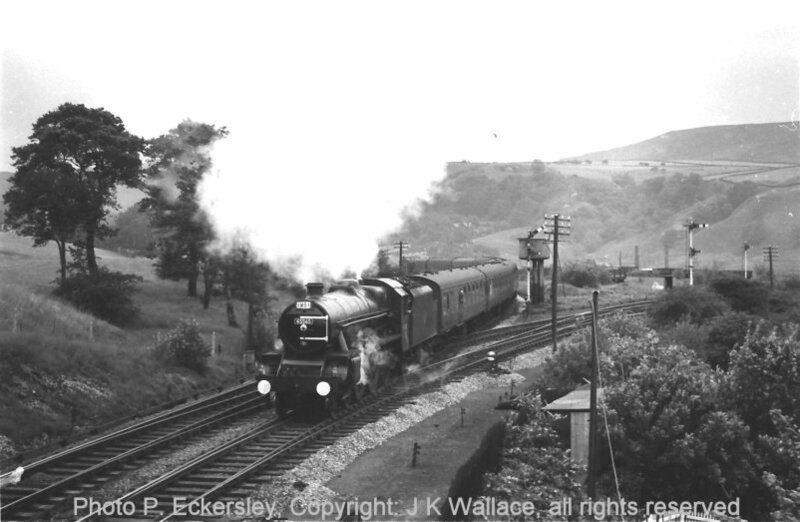 The train was caught briefly at Bowling Junction on its outward bound journey in B&R Video Production's Volume 37 'Lancashire & Yorkshire Memories Part 1', and also appears in various photo albums. Subsequent journeyings can be dated by the degree the white embellishments have weathered, the first to suffer being the buffers which collected black centres very quickly. There has been active discussion on the RailUK forum as to how the bankers returned to their siding from Copy Pit. The siding clearly has a diamond (on a curve), which means that locos would have used the cross-over by the signal box (lever 13 according to Chris Littleworth). As this is a trailing cross-over, locos are presumed to have been brought to a stand before reversing over the cross-over after ground signal 18 was cleared. Now standing on the Burnley line, they would have reversed again over points 13 (cross-over), 10 (Hall Royd Junction) and 14 (access via diamond to siding); discs 19 and 17 being cleared accordingly. 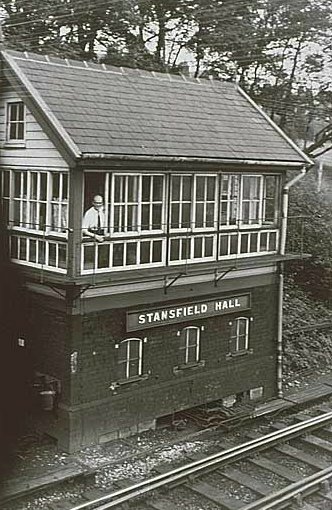 Richard Greenwood has noted: "I believe the reason for the strange track layout leading to the banker sidings at Stansfield Hall was so that a returning banker would get to the back of the queue of waiting bankers more easily rather than dropping on the front of the queue. The resignalling (1972/3?) involved a track alteration. A facing crossover was put in the site of Stansfield Hall station so that the diesel bankers did not have any reversing to do. Steam locos just reversed. Diesel locos reversing involved the driver changing ends". BR Standard 9F 2-10-0 92084 passes over the junction at Stansield Hall and heads towards Hall Royd Junction. Jubilee 45565 'Victoria' gets away from Stansfield Hall Junction, having taking water whilst heading special 1M91, assumed to be Blackpool bound, on 23 July 1966. Of note in this view are the two Stansfield Hall starters, both with calling-on arms for the bankers moving forward to assist a Copy Pit bound train. 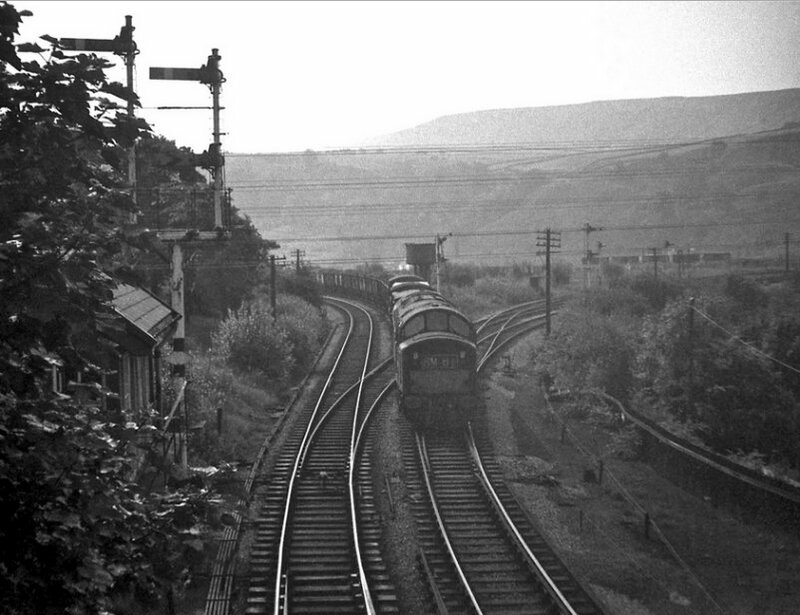 Also in 1966 they are both are still original wooden L&YR posts: a surprising number of signals in the Todmorden area still had wood posts in 1966: these two; the Todmorden East trident and the Up Burnley Line starter at Hall Royd. The shunting signal protecting the exit from the sidings onto the Down loop was also a wooden post - see below. 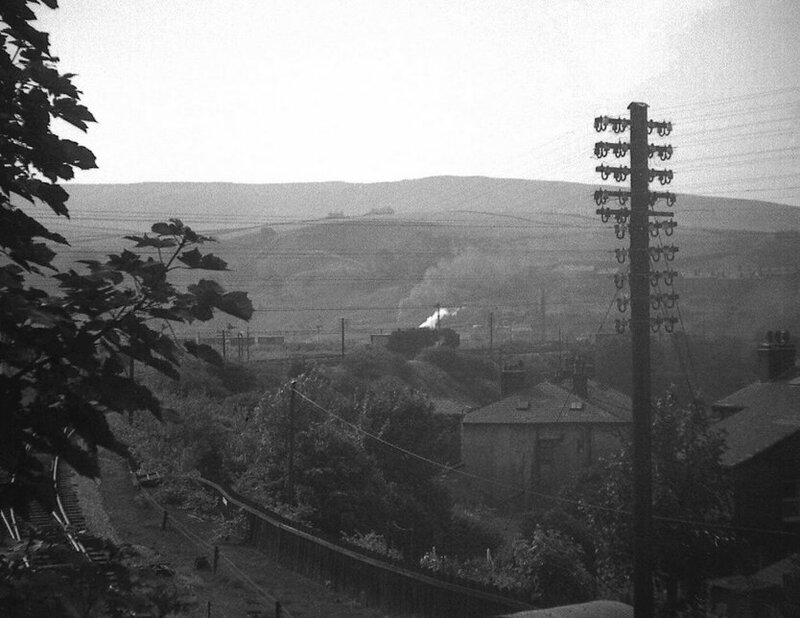 The signals at the Todmorden East-end of the Up Manchester goods loop and main line had wooden posts in 1942, and it is possible they remained so until their removal. 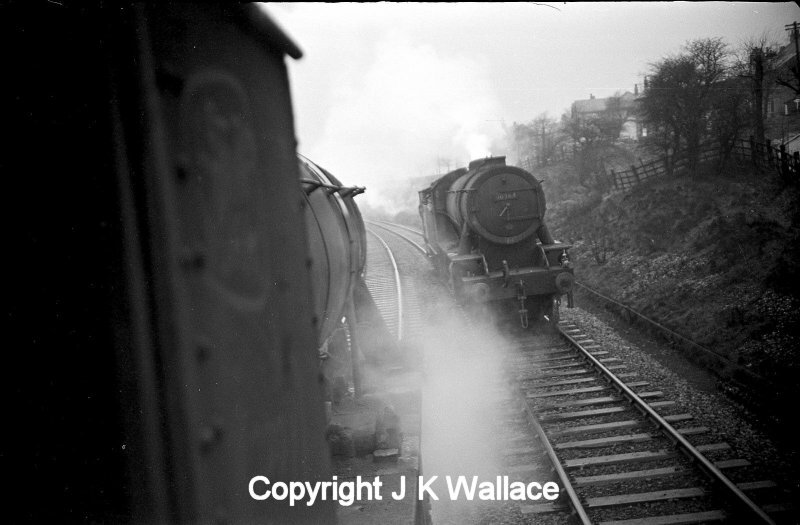 I make no apology for featuring loose-grip-99's (Flickr id) wonderfully atmospheric shots of Stansfield Hall Junction on 1 April 1968. The photographer has gone on to become a regular member of the footplate staff at the Great Central Railway in Loughborough. A mixed freight of mainly coal wagons arrives out of the sun and runs west onto the Burnley line at Stansfield Hall junction headed by a Class 40 diesel on train 8M81. 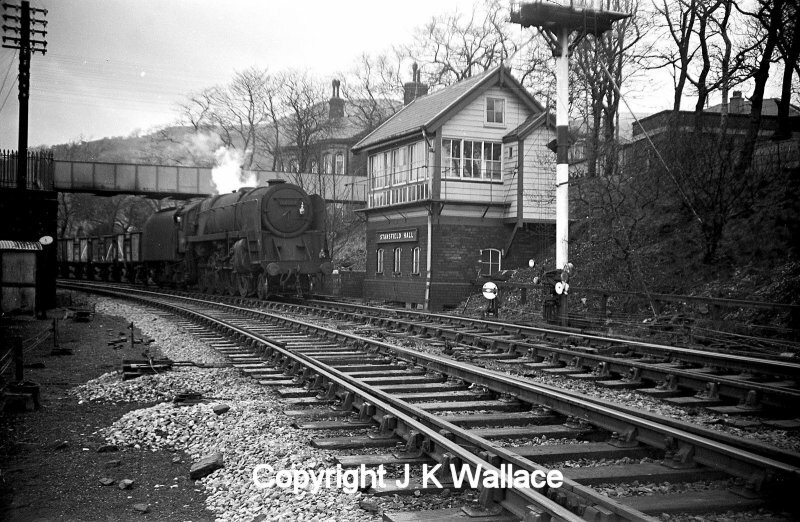 This is the first photo in the sequence and after the train passed the steam banker, 8F 48519, ran from the siding off to the right, passed under the footbridge - presumably under the control of the calling on subsidiary signal - to buffer up to the train and bank it up to Copy Pit summit. 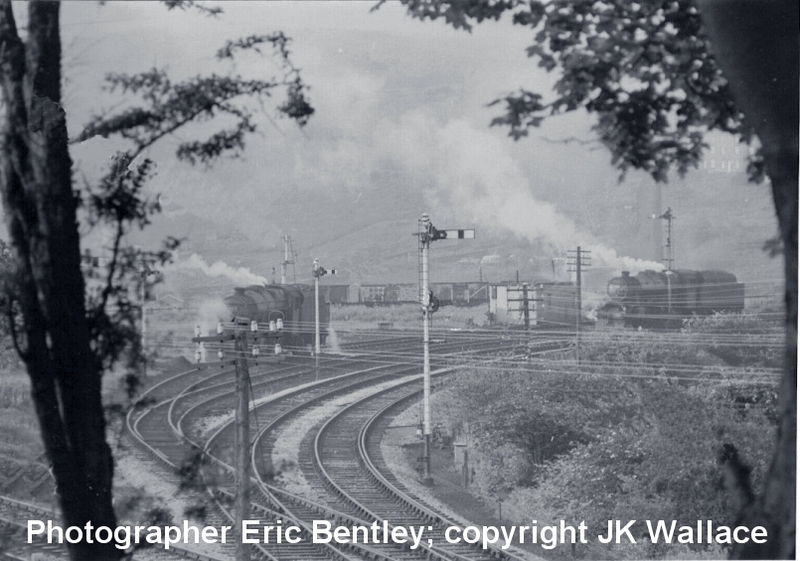 This was a triangular junction, the Hebdon Bridge and Halifax main line to the left, Todmorden station and Rochdale to the right and Burnley behind the camera. Stansfield Hall signal box is poking out of the trees on the left. Looking at these photos one wonders if the bracket signal protecting the junction could actually be seen through the tree that BR has failed to cut back. 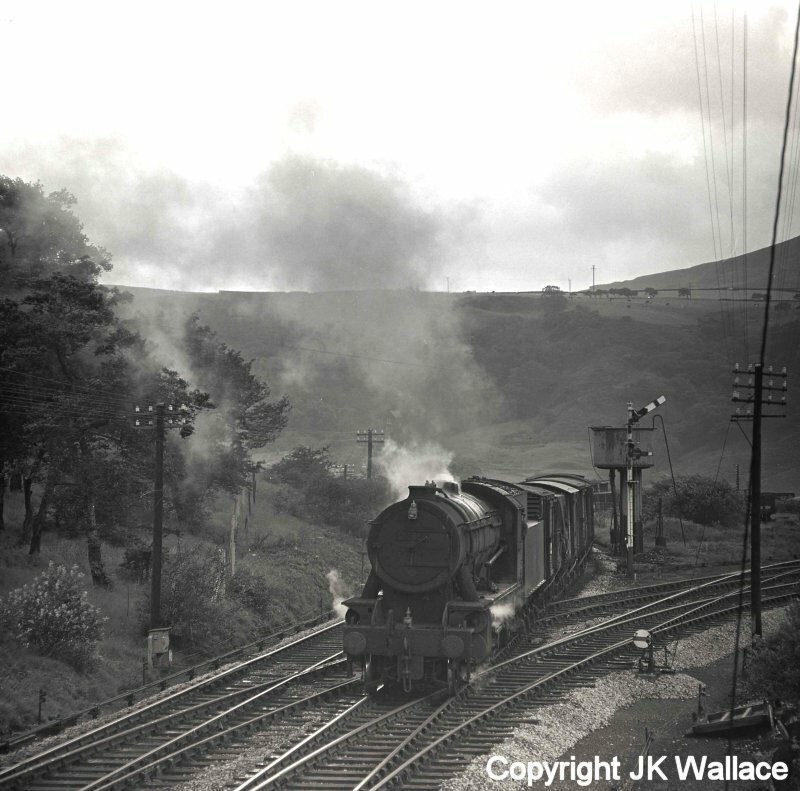 Copy Pit banker Stanier 8F 2-8-0 48519 of Rose Grove shed moves out of the siding by Hall Royd Junction Todmorden. A Class 40 diesel hauled freight train has just run onto the Burnley line from the West Riding - just visible bottom left - and stopped to wait for the steam banker. 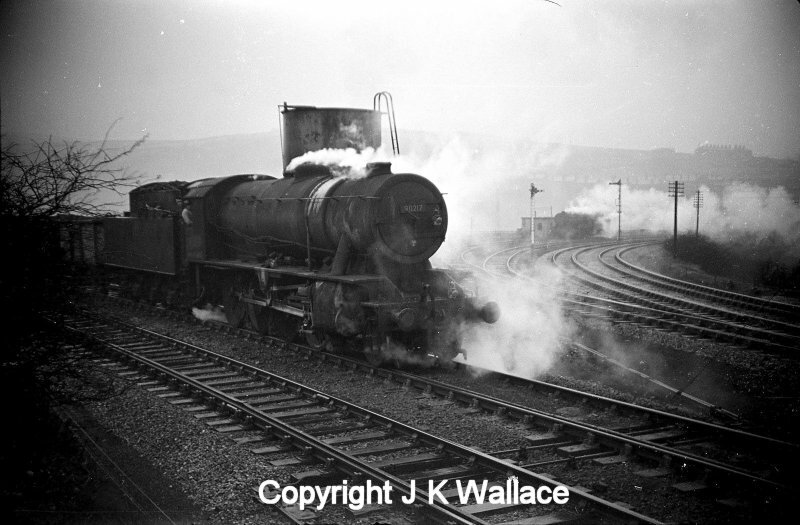 The grey/black smoke indicates that the fireman has just put a round on & the white feather at the safety valve shows that all is well on the boiler pressure side. 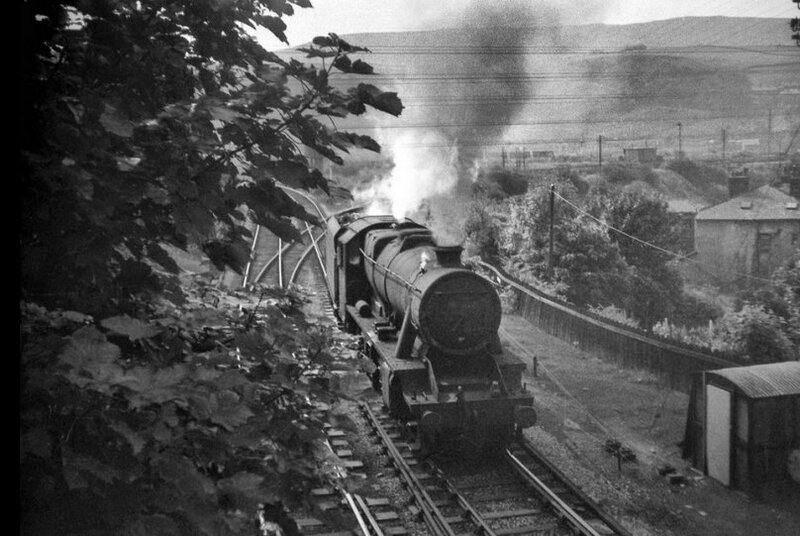 LMS Stanier 8F 2-8-0 48519 of Rose Grove shed heads out of the sun at Stansfield Hall Todmorden to buffer up to a Class 40 diesel-hauled coal train and bank it up to Copy Pit summit on the Burnley line on 1 August 1968, with only two more days to go for the Copy Pit bankers. 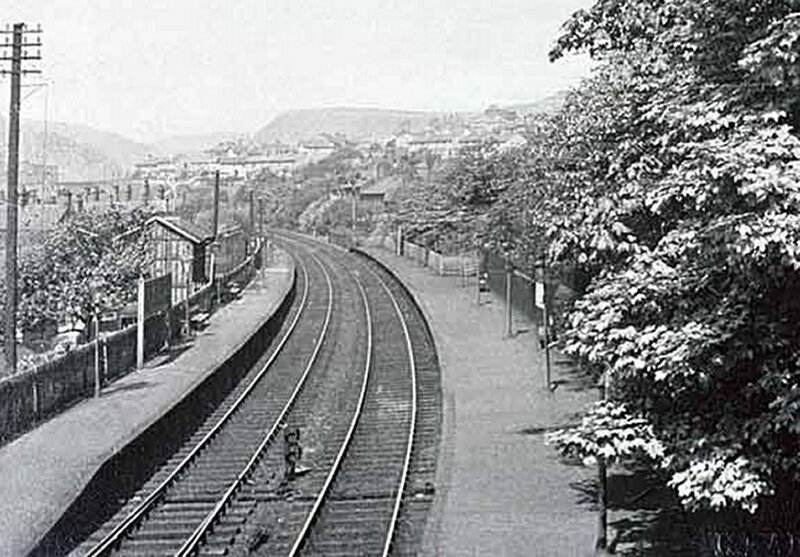 Note the Midland Railway-style asbestos lamp hut, which were present at all three Todmorden junctions. Todmorden to Burnley Copy Pit banking engine LMS Stanier 8F 2-8-0 48519 runs from the steam banker's siding at Stansfield Hall Todmorden to buffer up to a west-bound Class 40 diesel headed freight and then push it up the gradient (the van is just visible through the smoke from the loco). This was the last location where bankers could be seen in everyday action on British Railways by this time. The fireman has been building up the fire in anticipation of the hard work to come as witnessed by the black smoke & feathering safety valves. BR Standard 2-10-0 92084 passes Stansfield Hall signal box. 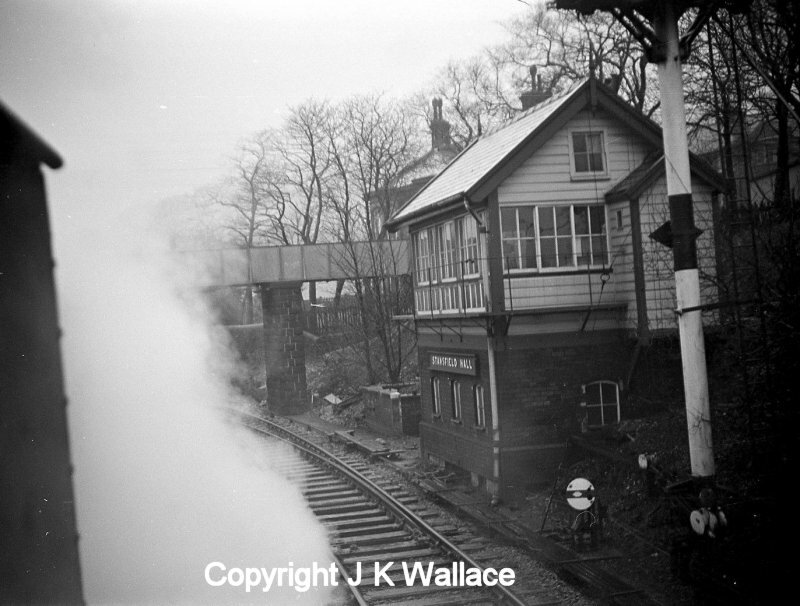 This shows the original footbridge, and the southern gable of the signal box. Note the lavatory unusually placed at the opposite end of the box from the door. Although not shown in this particular selection of photographs, in addition to the traditional steps at the northern end, the balcony was extended backwards, so that the box could also be accessed from the bank at the rear of the box. This was obviously a planned development, and hence the unusual location of the lavatory. LYRS Signalling Steward Chris Littleworth notes that there were probably other boxes like this, but they are few in number. The 9Fs made an early appearance on the mineral workingss via Copy Pit in the 1950s, and were then moved away in favour of WD Austerity 2-8-0s. Stansfield Hall Junction signal box and footbridge seen from the cab of a WD Austerity 2-8-0 taking the Copy Pit line with a mineral train. Note the stone pillar supporting the footbridge, which was hidden by the loco in the photo above. 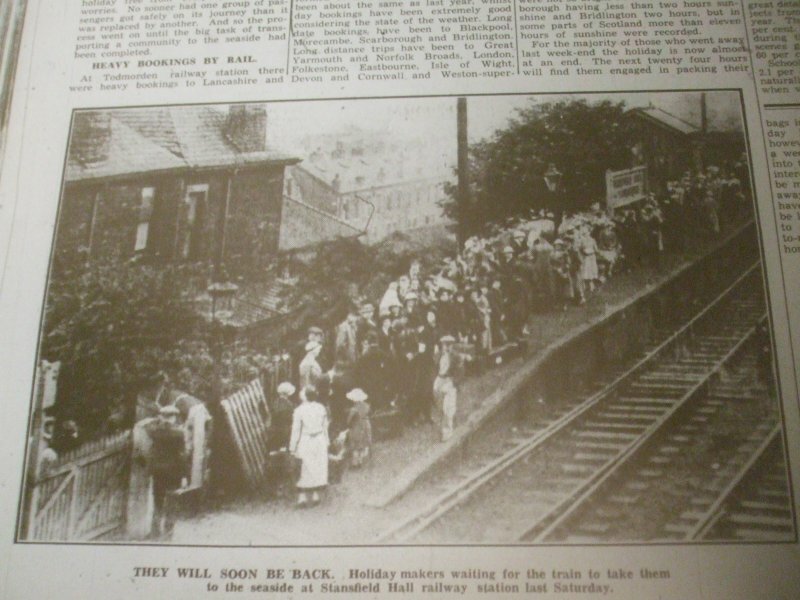 Stansfield Hall Halt as it appeared in the Todmorden Advertiser on 17 July 1936 showing excursionists gathering for their special train. Two WD Austerity 2-8-0s pass at Stansfield Hall on the Copy Pit line. 90364 is approaching with a brake van. Here is a reminder of what used to occupy this location at Stansfield Hall Junction. According to Chris Littleworth in 'Signal Boxes on Lancashire & Yorkshire Railway Lines: North East Lancashire', Published by the Signalling Record Society in 2002 (ISBN 1 873228 21 X) this is a size 3 brick-based box of L&Y design that was first inspected on 25 September 1895. It replaced a brick-built boxof unknown design which had carried the name 'Whiteplatts Junction' which Chris suggests was in use by 1873.